On the cover together; two characters that never met! Welcome back to the stylized, formerly kooky world of “wanzers.” That’s right, wanzers. They pronounce it “vanzers” in deference to the German. 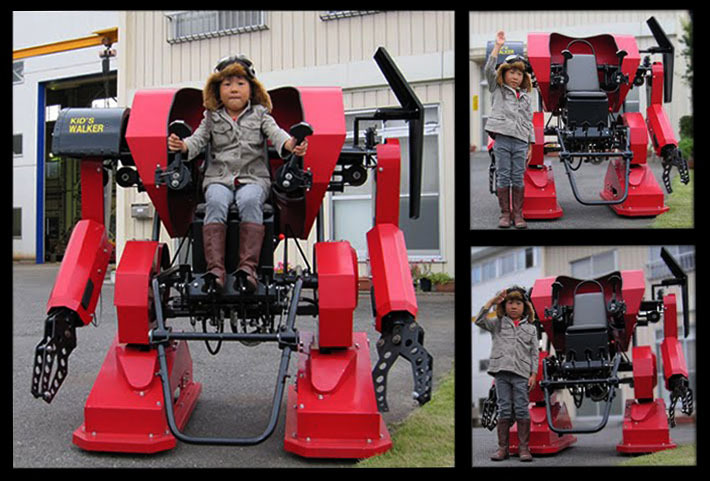 You’ll recognize them as mechs, gundams, walking tanks or even giant robots. 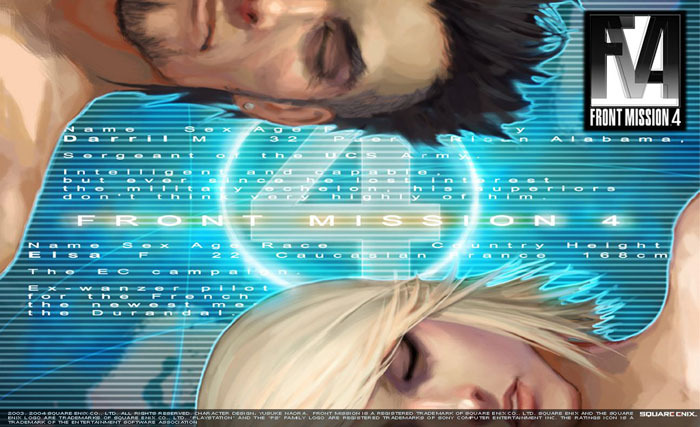 I had fond memories of Front Mission 3  and have to admit I was looking forward to this one. This franchise is one of the few tech-based SRPGs. It is interesting to compare the roles depicted in this game to those in a typical fantasy setting SRPG. Most wanzers have ranged attacks that liken them to archers. There are longer range rifle wanzers that are like the uncommon fantasy SRPG sniper/rifleman. Mechanics repair like white mages heal. Melee units pack a punch like sword or ax wielders. Grenade and rocket units damage wider areas like magic users. Despite the modern setting any experienced SRPG player will have no problem adjusting to the old roles in new forms. This franchise entry has a decidedly more serious tone evident right from the opening credits and cutscene. 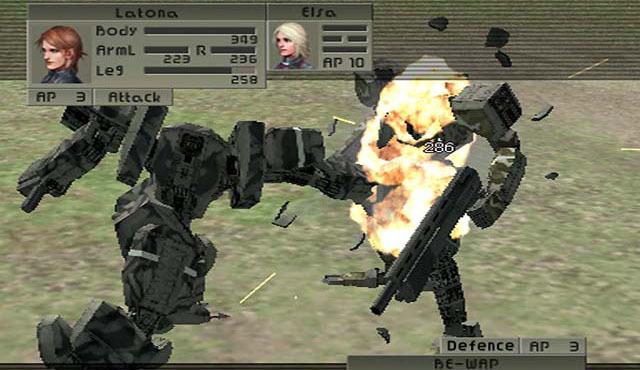 The quality is high but you might feel as though you were playing Metal Gear Solid. Gone are the humorous Front Mission 3 subplots involving a man promoting his incredibly uncool methane powered wanzers. Added are at least a dozen more accents. You will hear everything under the sun from British, Russian, French, German, a variety of South American and of course good old American. This game was an intermittently fun experience, yet hobbled by a few drawbacks. 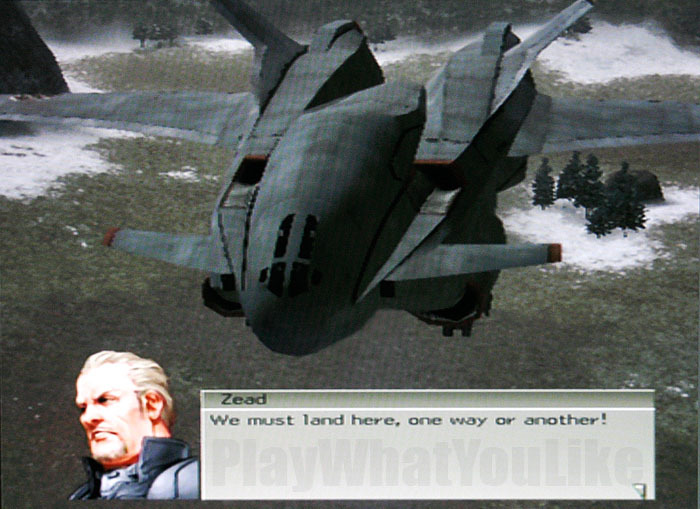 The Plane is the Star: A hero transport used throughout the game was well-designed and a pleasure to look upon. Many cutscenes featured it. Cash Incentive: Encouragement not to be damaged was the replacement cost of blown up parts subtracted from your after battle currency reward. Such incentives keep you engaged as opposed to miracle fixes where damaged wanzers are right as rain after the battle is over. The monetary component fit the setting. Slow Dancin’: Well choreographed game engine cut scenes were used to tell many story sequences. They took their time, did not skimp on animation and were creative with camera angles. They did not get old. Personalized TV: Cutscenes were interactive. 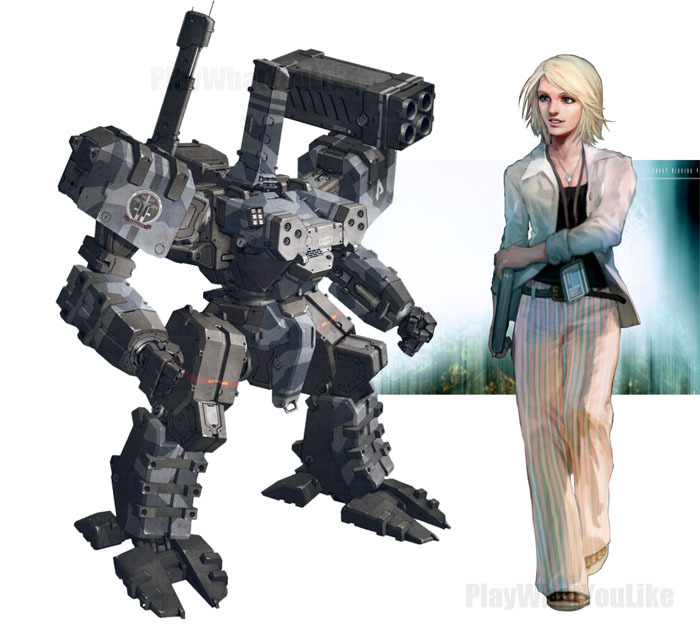 They were designed to hold certain shots (not statically paused, but rather in an active holding pattern) and waited for you to read and advance the dialogue and camera moves with button presses. A minor issue but a quality detail that added to engagement. 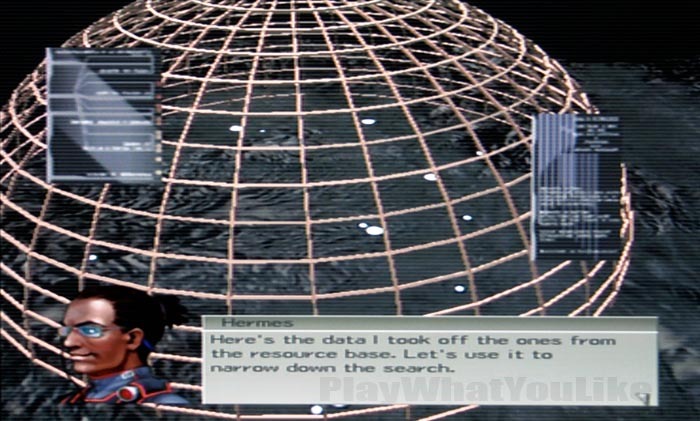 Storytelling Boost: Some briefing scenes featured computer displays during dialogue. For example they showed a radar display and actively animated it while characters discussed the details of what to do. Little things like this are under sung but benefit a game. Is this a briefing about “Thunderdome”? The Death Star? A huge wicker basket? Portraits: The semi realistic but stylized portraits fit the game and were consistent. It was a little strange when they moved their mouths with a single frame or two of animation, but I appreciated the effort. Varied characters were portrayed in this painted look. What’s Your Angle? When wanzers fought the angle often went down to “eye level.” These were often more exciting than your angled down administrative view and fun to watch. They did not unnecessarily slow the game. Get Behind Cover: Obstacles and elevations affected hit percentages. For line of sight shooters like rifle wanzers this was sometimes displayed with “x” markings on the interfering environmental piece. Even missiles were affected in tight quarters. That’s extra strategy. Ricochet Excitement: You would not believe how many tings, pings and ricochets your ear can distinguish. It’s quite a lot! The sound was very well done including explosions and missiles. It most definitely added to the satisfaction of destroying enemy wanzers. Character (IN)flexibility: You wanted your melee guy to use a rifle instead? It can be done. However the process was time-consuming, costly and cumbersome. Additionally it was not available early on leading to some disastrous consequences by weapons switching… Do it well or do not allow it. The Story- Intriguing… Sort Of: “Two plots; two sets of characters; two times the political intrigue!” Sadly it was only half as engrossing. It was hard to fully invest in these large international machinations and somewhat staid, sterile characters. The not entirely clear plots also helped little. Outrageous Accents: They were not as overdone as the French knight in Monty Python and the Holy Grail, but some of them were a little much. However over time they did grow on you and lend character to the production. Insert some stereotypical French army comment here. 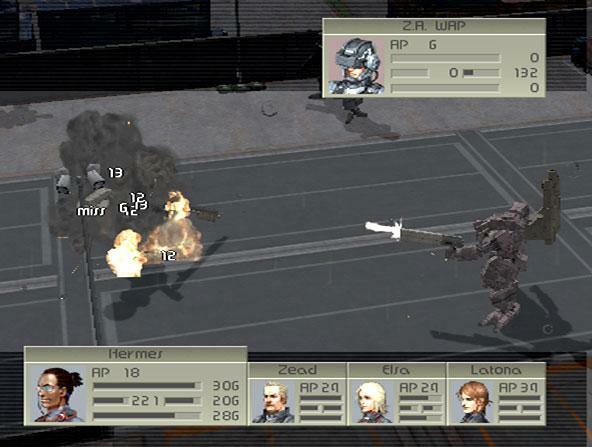 Know Your Limitations: You usually controlled five or six units in battle, but sometimes were given an extra squad. This did add to larger scale strategic decisions. However in a game already burdened with too much ‘stuff’ it added a heavy tactical load some might find too much. Change the Station: The techno-sounding music and interface background sounds were distinctive and consistent. They set the mood, but were not great. Additionally as is often the case, there was not enough variety in SRPGs where battles are long. Han Solo Wanna-be: The leader of the second cast is the “rogue with a heart of gold” stereotype. This kind of character is fun, but the story did not sufficiently explain his sudden change of heart. You can decide what you will about his squad of a lazy, semi-criminal slackers. Dry Teaching: It was nice that they actually walked you through the interface a few times in order to teach you a new feature. I like that. However overall the teaching was dry and wordy and wanting. Linked relationships could be manually set between squad members as “link points” were earned. The links could work offensively or defensively. Your linked buddy would attack with you if possible (in range, etc.) when set for offense. Your buddy would fire on someone attacking you if possible when set for defense. These links were powerful but not overly so like some SRPG “team attacks.” They were fun to watch play out every turn and affected how you strategically grouped units. However was a little cumbersome. The system was more flexible for dual wield weapons (sorry rifle guys). Also the interface and set up was unwieldy with the many factors that had to be considered. Additionally, these link actions were not free. They ate up precious action points, sometimes leaving buddies with no points at all with which to act when their turn came. They also used up ammunition for weapons you may have wanted to spend elsewhere. You had no control over defensive linked actions when the enemy attacked. The color coded grid system linked to APs worked well. Blue denoting possible move distance, red attack range, and green for repair if a wanzer is equipped with the right pack. I’m a fan of well done Action Point systems, and this one was pretty good. Selecting any unit at any time produced an on-screen AP count. Handy. It was a ‘move first’ system where you spent remaining points in the action phase. Points necessary for common actions were sensible. Only a few for a melee strike up to substantially more to fire missiles. If your unit was capable of a counterstrike your leftover points were used to that end during the enemy’s action. Although not specifically the AP system’s fault, it was a victim of automatic linked attacks. On the offense side it was hard to keep track of everyone who might be in range to participate in a battle started by any linked unit. Such units burned their APs (and ammunition) even at ineffective ranges. APs spent unintentionally left units unable to move or even counter. After the action phase allow units to spend the leftover APs moving. This was done well in Rebelstar: Tactical Command. Front Mission 4 cosplay fail. 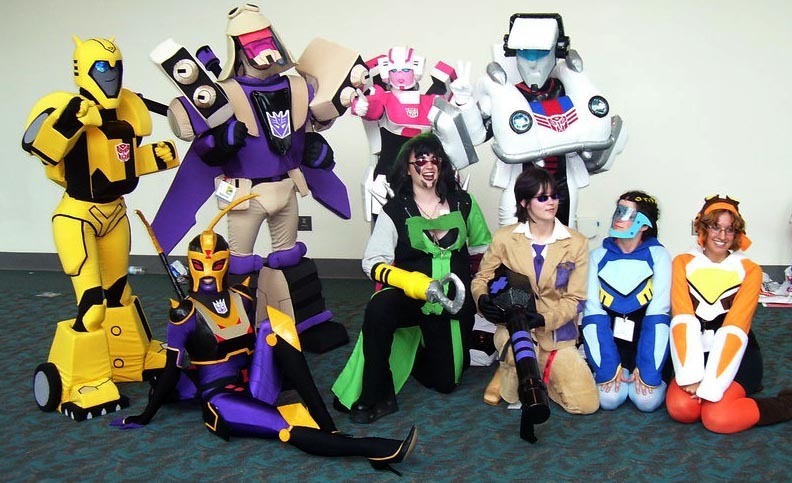 So instead settle for this picture of girls dressed as… robots? Break out the Reading Glasses: The font choice, size and even the contrast lacked maximum readability. Considering how much had to be read, it was a key accessibility point overlooked. I even played on a large TV. Their choices were better suited to a PC game. “Which guy is that again?” Optional wanzer color choices were slight and not sufficient to make your wanzers standout. Blandly colored environments and units combined with a distant camera view did not help. Come on, it’s a game. Clunky Commerce: The parts buying system design was unsatisfactory. Working with exiting parts required going to a different shop. Additionally there were separate shops for upgrades and pilot statistics… Ugh… Too many, especially with the game’s interface issues (see below). 98% Accurate… NOT! So you think when it says you have a 98% chance of hitting that you actually have a 98% chance of hitting? If you thought that you would be wrong. If the game is just taking a (really bad) guess or not considering other vital factors, why mislead? Why do it at all? Weapons – You Forgot Something: The number of weapons available was insufficient in comparison to time spent playing. For example after 15 hours of playing you only really had two types of shotgun, one of the major weapon classes. Additionally weapon variety could have been more distinctive and fun. Fat Writing: The political intrigue was already a layer too deep, so overly verbose writing soon made you button through. When will some game writers learn to keep it lean? Take a look at Fire Emblem (Blazing Sword – GBA) and see how well it can be done. The Terrain Has Flatlined: It was a system capable of using effectively terrain elevations and obstacles. However they only did so on a few of the battle maps. A waste. The mostly flat maps got repetitive in practicality if not in look. You’re so Transparent… NOT: A PlayStation 2 game should have translucency on environmental objects! 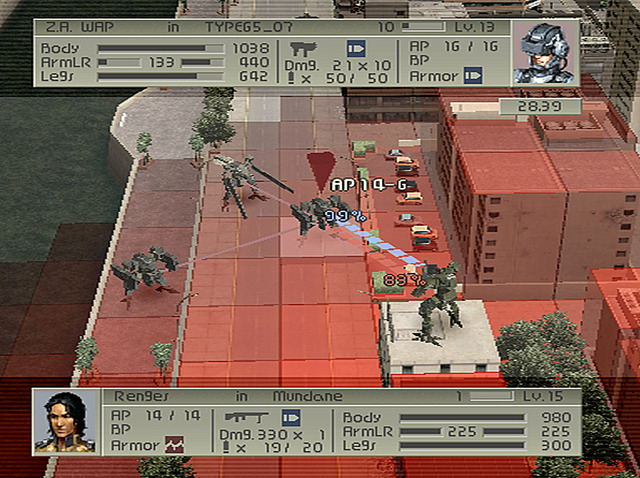 A game in a modern setting has tall buildings and such. Very often I found myself maneuvering the camera in an attempt to find units. Frustrating and unnecessary. Burnt Links: It is hard to anticipate outrageously long linked interactions (offense & defense). One of my tougher units received 4 machine-gun attacks AND 4 melee attacks in one turn. That was an outrageous exception thankfully, but still similar occurrences were too common. Sensor InSANitY: A nearby enemy wanzer is wearing a sensor backpack. Enemy missile units anywhere on map to fire into that sensor range. Maybe that sounded good around the design table. In reality it was frustrating as the enemy sacrificed sensor units unrealistically to bombard you with insanely ranged missile fire. (Attack) Power Hog: It happened too many times to be coincidental. 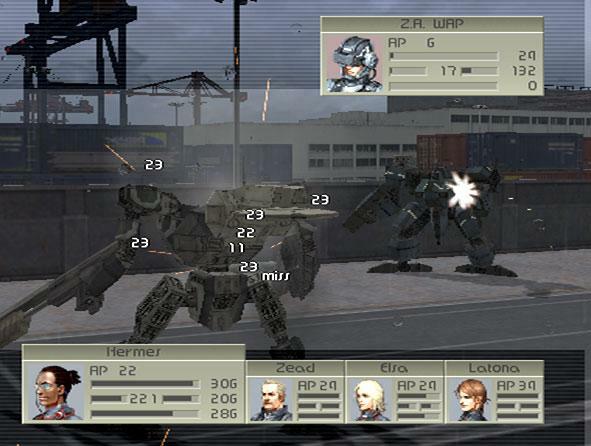 You can target a wanzer’s arms, body or legs. For example an enemy’s legs may have only two hit points left and you perform a melee strike for 100 points of damage. Frustratingly often you will hit those legs and 98 points of your attack will be wasted! Difficulty VS Tedium: The ramping left something to be desired. Too often difficulty was increased by increasing the number of enemy units. This led to longer more tedious battles. Additionally the few bosses looked okay, but played uninspired. How Cliché: This is not about lengthy writing not suitable to games. This is about using clichéd lines we’ve all heard before. Front Mission 3 did it but was a more humorous game. Cliches did not sit as well on 4. It had to be one of their shticks done on purpose. Who specifically said they were going to die. And were consumed in burning wreckage. Character life-and-death in a SRPG or any RPG is too important a factor to be unclear. If character death is real and permanent it makes you not want to lose anybody in battle. Here it was unclear and ultimately not serious enough. As is often the case the possibility of really losing a character in battle would have added to this game. Ugh. This was my biggest beef about the game. Every time you left an interface screen there was a fade out. Then a moment of nothing before a fade in. “Oh that doesn’t sound so bad,” you might say. But multiply this by a million. The poorly designed commerce and upgrade system required stops in four different shops. That’s a lot of fade in and out’s. It was horrible in its synergy. Sometimes you just needed to check on a statistic which sent you into one shop to find it, leave that shop, go back to where you were to act on it, etc., etc., ad infinitum! I can cite many types of common game actions made onerous by this incredibly unfriendly, time-consuming process. This game should have been a crisp 35 hour experience. Instead it became a 65 hour slog largely due to this endless series of micro-delays. This boy’s home wanzer moves swifter than Front Mission 4’s menus. Sometimes it is nice to have a confirmation so you do not accidentally delete an important save file or enter battle before you are ready, etc. 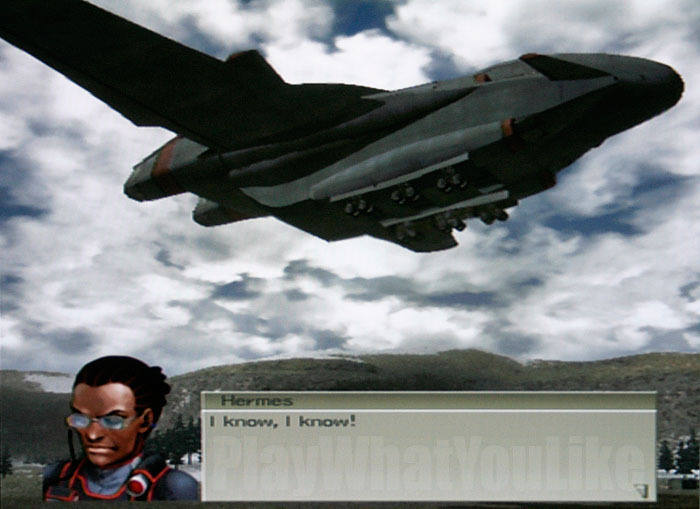 However front Mission 4 makes you confirm everything incessantly. Add this to the above issue and you’ve got conflagration of obstruction. “You’ve just selected to exit the shop. Do you really want to exit the shop?” Yes. “You’ve just successfully loaded a saved game. Okay, it has been successfully loaded. But wait. Are you sure you would you like to exit and play that loaded game?” YES! “You’ve just watched a cut scene. There’s nothing else you can do except stare at this ‘Yes/No’ confirmation we are showing you. Would you like to exit this worthless screen and go on with the game or select ‘No’ and stay here to do nothing… absolutely nothing! ?” $#@*&#! I do not think you ever see Elsa dressed like this. I give front Mission 4 props for its consistent universe. It’s interesting how they call Russia “Zaftra.” Most of the other countries use their actual names. Was there some political consideration in this? The characters from Zaftra spoke with a Russian accent, so there was little doubt what they were talking about even before you looked at the map. Some grinding was necessary, however not so much to ding the game, and grinding battles were half decent. A game that (mostly) gives you the experience you need to move the story at a fair difficulty level is deserving of props. I took the option to grind only a couple times when I needed money or a particular level was a difficult (mis)match. 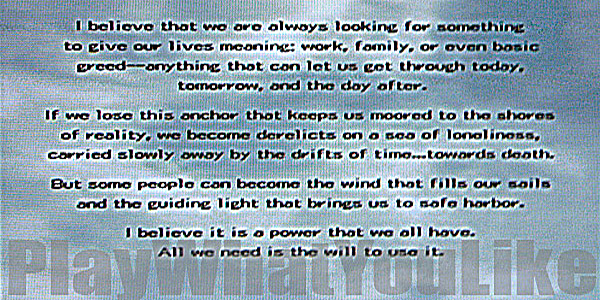 Are you seriously going to end this game with this overt, juvenile pseudo-philosophical nonsense? Front Mission 4 was technically well-made. It will furnish players with hours of fun tactical play -and hours of less fun strategic play. There is just no room for some of the elements that held this otherwise good game back. There is no reason to make the navigation and customization so onerous. This game did not know how to leave on a high note and dragged out your experience too long. It outlived its welcome more because of the interface than the gameplay. 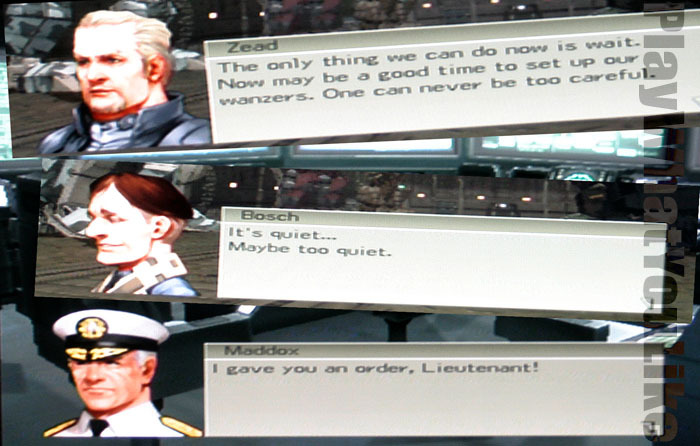 However because blowing up enemy wanzers was so much fun, I was willing to put up with too much tedium.